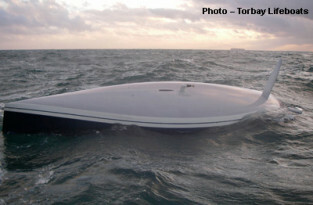 A crewmember aboard a 35ft yacht has been killed during a freak accident off Salcombe, Devon. According to early reports a 35ft Max Fun 35 – Holligan Five – capsized and sank minutes after its keel snapped off in the early hours of Saturday morning in relatively flat conditions. The other four members of the crew, aged between 18 and 61, managed to fire a distress signal and scramble into a life raft before being rescued by the German coasterLaarbefore being transferred by helicopter to Plymouth hospital. According to Ham the yacht has been picked up this morning somewhere off Plymouth although he was unable to confirm at this stage where she was being taken to. An inquiry is now underway by the Marine Accident Investigation Branch into how the structure of the yacht could have failed so catastrophically.